Reasons for managing credit risk and who is responsible? The key purpose of credit risk management is for a bank to maximize its risk-adjusted rate of return while maintaining exposure within its acceptable risk tolerance (risk appetite). Credit risk is diversifiable but impossible to fully eliminate and poses significant challenges. It involves the establishment of the distribution of probabilities of default (PD), loss given default (LGD), and credit exposures; measured in a portfolio context. According to the Bank of International Settlements, it is the responsibility of the board of directors and senior management to ensure that the bank has the appropriate credit risk assessment processes and an effective internal control environment to properly manage credit risk. Best practices require that an internal control framework for credit risk assessment include a clear loan review process that is independent of the lending unit. The loan review process should contain a credit grading system that will identify and rank loan quality and credit risk characteristics. The established system must be applied consistently across the loan portfolio. The credit grading system is an important tool for classifying the various credit exposures of a bank. An effective credit grading system will determine the overall risk of the loan portfolio, PD, and the sufficiency of the provisions for loan losses. Loans should be classified on the basis of potential credit risk. The factors that the credit grading system should consider include the borrower’s financial condition, capacity to pay, value of the collateral and other characteristics that may influence the likelihood of the collection of principal and interest. A key aspect of credit risk management is the ability of a bank to diversify across defaults. The rule of diversification supports that a portfolio of multiple loans is less risky than a single loan. One way to diversify the portfolio is to set concentration limits. A bank can limit the exposure of its loan portfolio to a specific geographical area or to an industry. The logic behind this is that the correlation of defaults is higher within sectors vs. across sectors. It is difficult to measure credit risk internally due to the lack of history of defaults (for specific borrowers, industries, etc), therefore, some banks use credit risk models such as Moody’s KMV. The model provides forecasts of estimated default frequencies (EDFs) for public firms using the Merton approach. 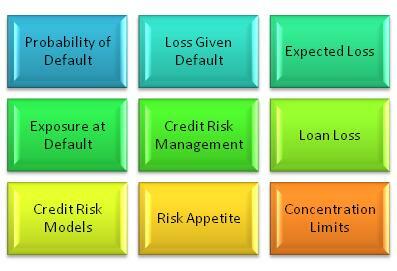 The credit risk models can also assist in the calculation of PD & LGD for various borrower types. The board of directors and senior management’s tolerance for risk (risk appetite) is well-communicated and fully understood. The bank has a strong culture of risk awareness. Credit analysis is comprehensive and timely. Credit risk grading systems effectively stratify credit risk and are used as early warning tools or key risk indicators (KRIs). Management information systems (MIS) provide an accurate, timely and comprehensive view of the portfolio. Concentration limits are set at reasonable levels to help diversify the portfolio and protect against the risk of correlated defaults. Strategic plans are consistent with the established risk appetite and promote an appropriate balance between risk and earnings growth. It is important that a bank’s board of directors and senior management enforce proper internal controls to ensure that credit exposures are within the established risk appetite and that any exceptions to policies or limits are reported to the appropriate level of management.